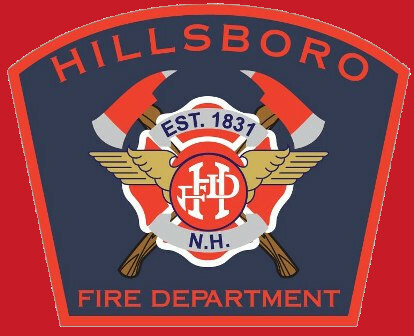 The Hillsboro Fire Department provides Fire Protection and Emergency Medical Services to the Town of Hillsboro, New Hampshire, a community covering approximately 42 square miles with an estimated population of 6,000 residents. The Department provides these services through a complement of 40 members; 2 full-time, 34 call personnel, and 4 chief officers. Our station is located on Central St. and it is staffed Monday through Friday, 0700 to 1700. Our apparatus includes two ALS-equipped ambulances, heavy rescue unit, two engines, two tankers, an 85-foot aerial ladder, and a forestry vehicle. Firefighting personnel are constantly engaged in firefighting, emergency medical and rescue training. All Hillsboro firefighters are required to pass the NH Fire Standards and Training Firefighter Level I program and all rescue personnel are required to obtain National Registry certification. Achieving and maintaining an educated and high caliber force ensures that the Department is always poised to protect the community of Hillsboro. In addition to responding to emergency calls, the Hillsboro Fire Department provides proactive prevention services such as fire safety inspections of commercial and residential properties, site plan reviews, and fire and environmental safety education. It is the mission of the Hillsboro Fire Department/Emergency Medical Services to preserve life and property, promote public safety and foster growth of the department through leadership, management, and actions as an all risk life safety response provider. To provide fire protection, emergency medical services, community education, and effective communications with the Town of Hillsboro utilizing a call/fulltime staff. We will provide the residents the highest quality of service possible, characterized by responsiveness, integrity, and professionalism. We will continually strive for quality improvement. We will as the Hillsboro Fire Department/Emergency Medical Services give our full commitment and dedication. We will always look beyond the traditional scope of our individual positions to promote teamwork and organizational effectiveness. We will give each other a working environment characterized by trust and respect for the individual, fostering open and honest communication at all levels. We give ourselves personal and professional growth. We will seek new knowledge and greater challenges, and strive to remain at the leading edge of our profession. Develop a system of effective communication between all members, other departments, and the citizens of the Town of Hillsboro. Provide an effective Fire Prevention and Public Education system through fire inspections, public address, and interacting with members of the community. Provide professional fire protection through leadership, training, and good moral values. Provide an effective and timely Emergency Medical Services system where we will continually update and change with the ever changing EMS system.